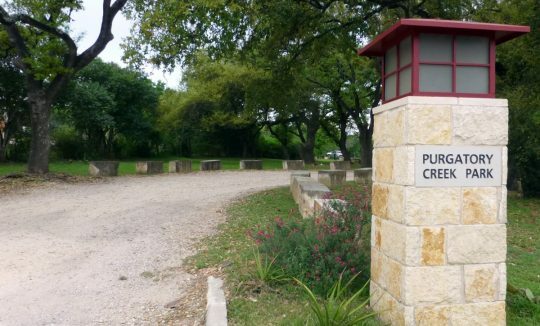 The City of San Marcos has six beautiful natural areas consisting of more than 1,200 acres with more than 22 miles of trails. Each natural area has its own personality and attraction. In all cases, their purpose is to provide flood mitigation, water quality, clean air, wildlife refuge, recreation, exercise opportunities, transportation corridors and outdoor classrooms. Natural areas, as opposed to city parks, are limited in amenities and conveniences. Experienced and enthusiastic SMGA members lead guided hikes in the natural areas including birding and bug walks. Scheduled hikes are listed in the News and Events Section and on our Facebook page, San Marcos Greenbelt Alliance. The walks are geared for all ages and experience levels. The birding lists are compiled on eBird from Cornell Labs. *Click here to view online map. Prospect Park (Prospect Street) is the original natural area begun two decades ago as developers began work to clear the land. Several forward-thinking individuals worked with the city council to create parkland of about 9 acres. Prospect Park sits on a rather porous section of the Edwards Aquifer with prominent karst features (rainwater flowing into the ground through limestone rocks). Ashe juniper groves, grassland meadows, ephemeral wetlands and oak mottes co-exist. Benches and interpretive signs are located along the trail. A large compass and opposite, The Learning Tree, provide seating and education opportunities in the lower meadow. Lower Purgatory (Hunter Road) is the most popular trailhead and fills up quickly on weekends and late morning Spring days. It is a destination for serious mountain bikers and trail runners looking for the technical difficulty of avoiding rocks and tree roots as the trail is natural surface single-track. More than 12 miles of trail flow uphill to the Valencia Way trailhead. Popular trails are Dante, Beatrice, Ovid and Ripheus. Upper Purgatory (Valencia Way) is equally popular but access is from a half-mile of caliche road (turn-off from Craddock). Popular trails are Dante, Paraiso and Malacoda where Purgatory Creek has carved a large grotto in the limestone cliff. In addition to trail runners and mountain bikers, this is also a popular hike for birders and nature explorers. Note to trail users: check the map at the trail head or take a paper copy with you. Bring water and stay on marked trails, avoiding deer runs and renegade trails. Do not cross fences. During March 1 – May 30 Paraiso Trail is closed to allow Golden Cheek Warbler nesting. We obtained funds to purchase these lands with the stipulation that we would protect this endangered species. 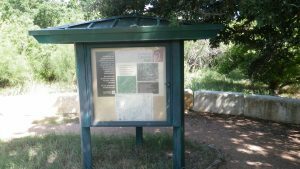 Three trailheads are available for the second largest natural area on the northeast side of San Marcos. Spring Lake consists of 251 acres of undeveloped parkland that sits just above the headwaters of the San Marcos River. About half of the property is in the Edwards Aquifer Recharge zone, and all of the property is part of the Sink Creek watershed. San Marcos Springs and Spring Lake are rare ecological jewels among Texas water resources and support five endangered species. The area supported ranching and hunting for many years, but has recently been left largely undisturbed with the exception of some natural-surface trails. Spring Lake Natural Area contains the typical meadows and woodlands found in the Edwards Plateau, with a wide variety of flora and fauna, including Mexican buckeye and large mammals. The geology includes layers of the Eagle-Ford, Georgetown, Del Rio clay and Edwards limestone. Spring Lake Natural Area is one of the prettiest natural areas with majestic live oaks draped in Spanish moss, flowering Mountain Laurel (two weeks in March), flowering Kidneywood (April) and many other butterfly attractors. The meadow along Blue Stem in the Spring has an assortment of wildflowers and its namesake, Blue Stem grasses, a Texas native. More than six miles of trails traverse the 251 acres with elevation changes from the hillside down to the meadow. The area around San Marcos Springs is thought to be one of the longest continuously occupied areas in North America due to its proximity to the San Marcos Springs. In 1926, A.B. Rogers purchased land around the springs and built the Aquarena Springs Resort. Aquarena was sold to Texas State University in the 1990s, and the 251 acres were later sold for residential development. In 2004, the developer and the City of San Marcos were preparing to create a large hotel and conference center on the highest location above the springs. 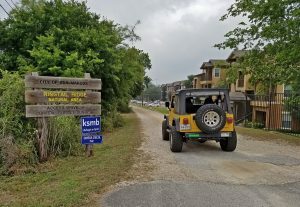 Citizens and conservationists objected, the development was moved east of IH-35, and the City, Hays County and Texas State University committed to securing the property as a natural area. In November 2005, SMGA led a campaign for approval of a $2 million bond as payment toward purchase of the 251 acres. Subsequent grants and donations from Hays County, Texas Parks & Wildlife, the U.S. Department of the Interior, the Meadows Foundation, Terry Gilmore, the McCoy Foundation, the Lower Colorado River Authority, and the Guadalupe-Blanco River Authority allowed the city to purchase the land in 2007. Certain hillside trails are closed March through May for Golden Cheek Warbler nesting season as posted at the trail heads and on signs within the natural areas. Please respect this restriction as we acquired the property with this stipulation. More than half the property is open year-round. Ringtail Ridge is located on a caliche road between Dakota Ranch Apartments and Crestwood U-Haul with an additional pedestrian and biking trailhead between Community Baptist Church and Dakota Ranch Apartments. 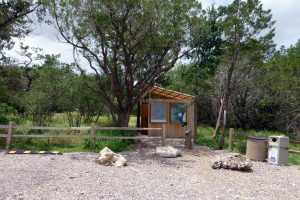 This natural area is made up of 45 acres with a ½-mile Tex’s Trail, a caliche trail circling three wet-weather ponds and an additional 2 ½ mile single-track trail offering a beginner mountain bike experience. The stock ponds offer opportunities for birding and bug walks not easily found on the drier Purgatory Creek Natural Area. The natural area is the former site of the Hughson Meat Company founded in 1947 by Cecil “Pop” Hughson and his brother, Johnny Hughson. 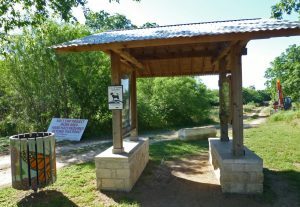 The Texas Parks and Wildlife Department awarded the City of San Marcos and SMGA a National Trails Grant in the amount of $40,087 in August 2007 to help fund the project which included a one-half mile accessible trail, parking lot improvements, and an interpretive kiosk. Schulle Canyon has 21 acres of natural parkland with oak, elm and Bois d’arc trees. A ½-mile, six-foot wide accessible trail of crushed limestone forms the Virginia Witte Way trail. The natural area is listed as the Heart of Texas East #61 wildlife trail. Birds viewed here include Kinglets, Thrushes, Wrens, Chickadees and Cardinals. This is a great site for the beginner birder or person with limited mobility. Blanco Shoals consists of 81 acres west of the Blanco River and east of IH-35. Blanco Shoals is completely undeveloped riparian with no defined trails. It contains high bluffs and shoals along the river, an outstanding example of the flood mitigation benefits of our natural areas. Gigantic Pecans, tall Cottonwoods and Sycamores and Anancuas grace the landscape. During summer months giant ragweed and Johnson Grass may overtake the property until mowed. The flat property makes for a comfortable stroll with hawks, woodpeckers and bluebirds among the species seen at this location. The land was donated in 2002 by the Holt family in exchange for changes in the zoning of the remaining portion of the land to permit multi-family and commercial use. Sessom Creek Park is a 14-acre park bounded by Chestnut Street, Sessom Drive, Loquat Street and Canyon Road. Two trails traverse the park in different ways. One rambles through the wooded space from the crossing of Sessom Creek at Canyon Road to Chestnut Street, above the Ella Lofts. 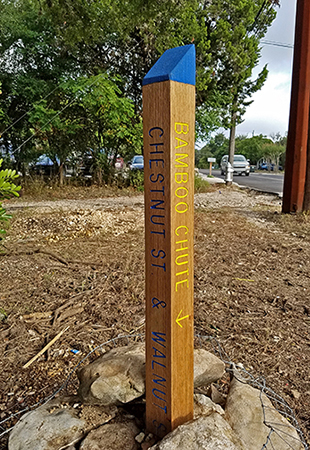 The second provides a transportation option for pedestrians along Chestnut Street walking to and from the Texas State campus area. The park is open but undergoing invasive plant removal and restoration. Parks are open sunrise to sunset (curfew applies after sunset). Keep dogs on a leash and remove their waste, doggy bags are usually available. Campfires, Styrofoam, glass containers, motor vehicles, weapons, horses, and camping are not permitted. Stay on established trails on public property. Bicycles must yield to hikers and refrain from biking on muddy trails. Report problems to San Marcos Parks & Recreation at (512) 393-8400.